So many restaurant themes these days have dark, sophisticated designs which look very professional and polished but this kind of design is probably not appropriate for more informal restaurants. The Restaurant theme fills this gap in the market well and comes with all the features you’ll need. The theme is designed very well and it is very simple to use, just like Organic Themes other products. Most of the internal pages look like traditional blog posts with a content area and a sidebar and whilst they are not particularly engaging, they work well enough. The page that really stands out for me is the menu page. This is an important page for any restaurant theme and it is executed really well here. It is clearly laid out, simple and very easy to set up. On top of the nice design and simple templates you’ll get a collection of useful elements that you can put in your page in order to jazz up your content a bit. You’ll be able to add accordions, buttons, tabs, icons and more. These elements can all be added via shortcodes. One thing that is missing from the theme that I would like to see is some reservation functionality. The theme does provide the option to get in touch via phone or contact form but I think many users would want an actual booking engine, ideally integrated with a third party platform like OpenTable. If you did want this, you could always add it in yourself but you’d need to do a bit of extra work. 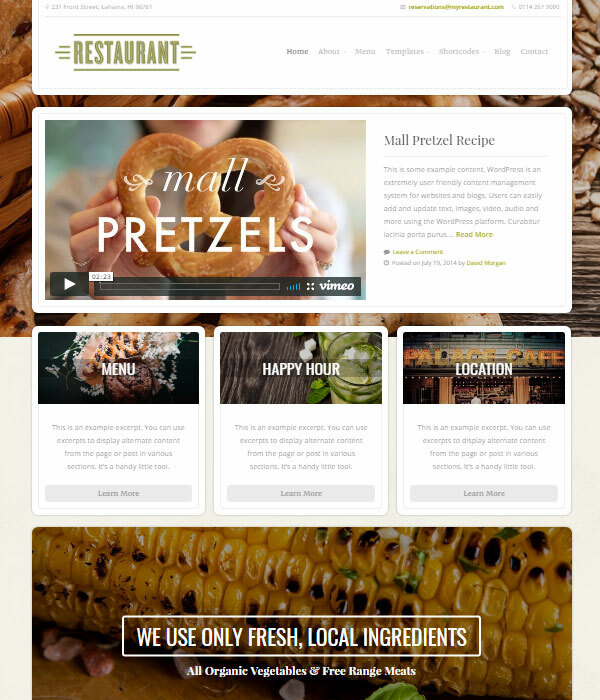 Overall, this is a great theme and it is well worth considering if you are setting up a website for a restaurant or cafe.